The big Sky Blanket crochet project is done, and I am in no mood to snuff out my re-kindled passion for the craft. I don’t want to take on another marathon project this year. What I intend to do is crochet a wide range of crochet clothes and accessories instead. Starting with this beautiful uneven ruffle flower. It is super easy to make, but can add that extra dimension to most anything. 4 – ch1 to turn. 1 double crochet (dc) in the same stitch. 1 dc in each subsequent stitch to complete the round. Join with a ss and tie off. This is a very basic crochet pattern, suitable for beginners. The end creation is highly versatile. You can use the ruffle flower to embellish other craft or crochet projects, like this crochet beanie hat that I made. Or you can use it to build a flower-based project. 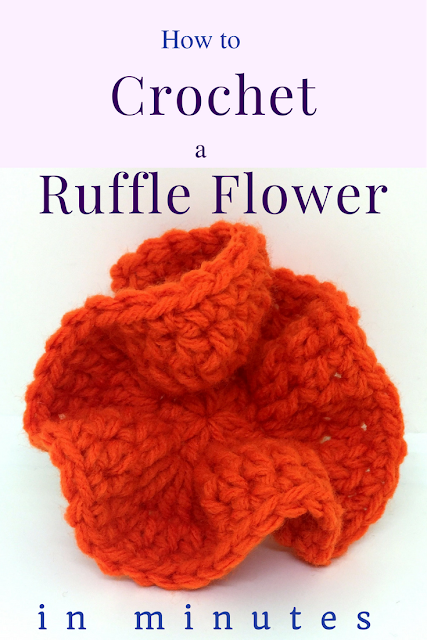 Watch this space for ideas and inspiration of all you can do with this simple and pretty ruffle crochet flower.